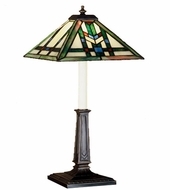 Tiffany table lamps are no longer the province of the well-to-do; now they are affordable for all of you. 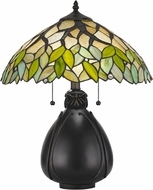 From the exquisite coloring of the Jackson, to leafy texture of the Arvore, Tiffany Table Lamps have come of age. 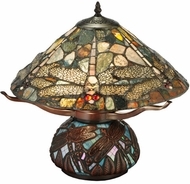 There's the southwestern motif featured in the Santa Fe, and Succotash shape of the Everett; the tropical style of the Palmera, and the Native American inspired Indian Summer; the elegance of the Emma, with its swooning plumage, and the mosaic pattern of the Walden; the surreal Dragonfly, and the ornate Wisteria. 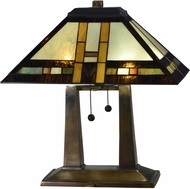 Short, squat, lean or lanky, these gorgeous Tiffany table lamps are the finest in the business, and prices are lower than ever before. 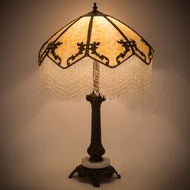 So dust off those end tables, and add a table lamp, Tiffany style treat to your home lighting decor. 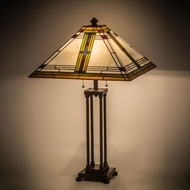 Tiffany table lamps and Tiffany style pendant lights have a reputation for their timeless elegance and classic style. 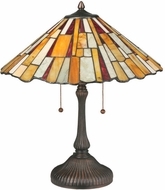 Warm, vibrant hues glow through the art glass shades of Tiffany lights and the powerful, heavy bases that often accompany them. 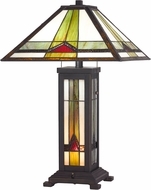 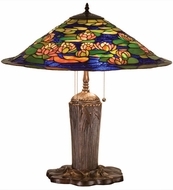 Known for their elaborately constructed, thick glass shades, Tiffany style table lamps and Tiffany style pendant lights have a unique sophistication and character about them because every lamp is made differently, with artful decor at the top of the list of expectations for any table lamp. 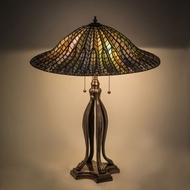 Tiffany offers home designs that complement overhead lighting like ceiling fixtures and pendant lights, but nothing can compare with the beauty of a perfectly constructed discount table lamp, Tiffany style. 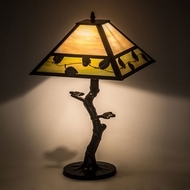 While there is an impressive variety of table lamps available for all your home furnishing needs, nothing quite captures the true, fundamental splendor of Tiffany table lamps, casting their warm and glorious glow over your entire living room or office. 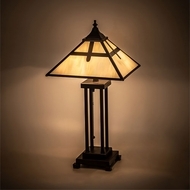 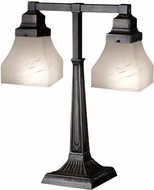 This effect really creates a sense of intimacy and calm and pairs well with more traditional or rustic home lamps. 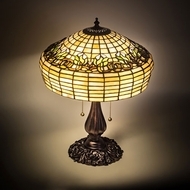 Avoid the cheap table lamps, stick with the sophistication and elegance of beautiful Tiffany lights. 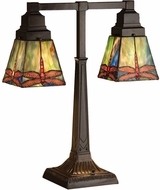 While there are certainly contemporary decor layouts that would complement your small Tiffany lamps (and vice versa) these lovely lights often seem at home in more traditional, Old World settings. 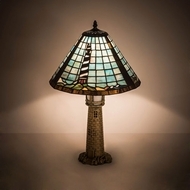 Some Tiffany table lamps actually have an almost fairy tale quality to them and often evoke memories of magnificent churches with their stained glass shades and exquisitely detailed bases. 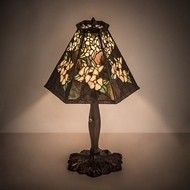 While Tiffany table lamps are not made with energy efficient lighting technology, such as fluorescent or LED lights, they are perfect for setting a mood and creating a heavenly, peaceful environment for a hallway, end table, or desk. 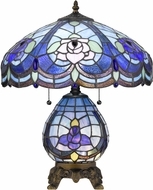 Lamps, Tiffany style have lasted through the ages and will continue to invoke delight and admiration in interior decorators and designers for years to come. 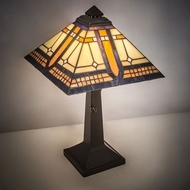 Buy your lamps, Tiffany style, today!